Simplify3D has today announced the release of their latest universal 3D printer operating system in the form of version 3.0 which brings with it a wealth of new features and enhancements for $149 per license. The new Simplify3D 3D printer OS brings additional support for 25 new printers adding to the already 100 different 3D printing systems that the software already supports. The new systems supported by Simplify3D version 3 include Bonsai Lab’s BS01, bq’s Prusa i3 Hephestos and Witbox, the DeltaMaker 3D Printer, the FusionTech ideaPrinter F100, the gCreate gMax 1.5 XT, German RepRap’s PRotos V3 and X350, the LulzBot Mini and TAZ 5, the Malyan M180, the Mankati Fullscale XT, the MendelMax 3.0, the Printrbot Plus Single and Dual, the Rostock MAX v2, the Sharebot Kiwi-3D, Dual, and XXL, the Solidoodle 4, Press, and Workbench, the Tumaker Voladora, and the Ultimaker 2 Go and Extended. 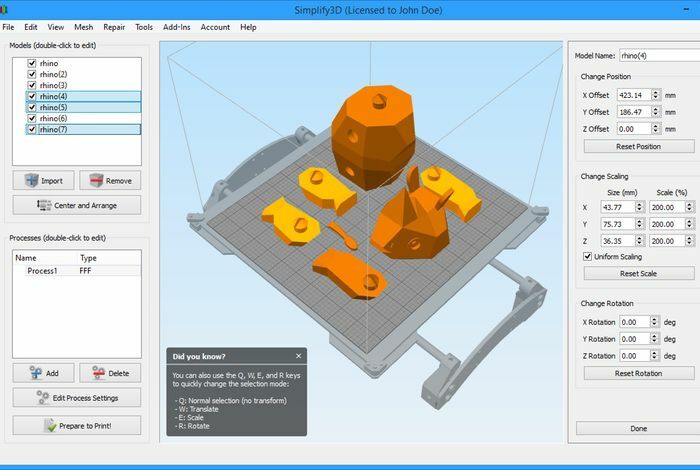 Simplify3D CEO Clayton Webster explains more about what you can expect in the latest version. Version 3.0 blurs the boundaries between the output of desktop and industrial 3D printers. Our users constantly astound us with what they are able to create, and we’re committed to providing the tools they need to bring their ideas to life. Their work inspires everything we do.” Webster adds, “faster slicing helps with complex models and multi-part jobs, but it also allows for faster iteration. Combined with our realistic animated Preview Mode, this allows our users to make small settings changes and instantly see how they will affect the final print. – Improved print quality. Features such as “Avoid Crossing Outlines” help reduce oozing, while “Non-Stationary Retractions” reduces defects (a.k.a. “zits”) on the outer surface of the printed model. These fine-tuning controls truly make the difference between a good print and a great print. – Smarter printer profile system. Everyone modifies their print settings to achieve just the right balance for their printer, but now Simplify3D allows you to save your unique printer settings. Users can create a brand new printer profile system that streamlines the process of adding and saving profiles. Users with multiple 3D printers will find this feature particularly useful. Also, an instantly updated cloud based storage system communicates with a desktop software assuring that all profiles are up-to-date.